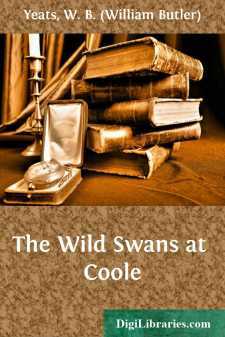 THE WILD SWANS AT COOLE The trees are in their autumn beauty,The woodland paths are dry,Under the October twilight the waterMirrors a still sky;Upon the brimming water among the stonesAre nine and fifty swans. The nineteenth Autumn has come upon meSince I first made my count;I saw, before I had well finished,All suddenly mountAnd scatter wheeling in great broken ringsUpon their clamorous wings. I have looked upon those brilliant creatures,And now my heart is sore.All's changed since I, hearing at twilight,The first time on this shore,The bell-beat of their wings above my head,Trod with a lighter tread. Unwearied still, lover by lover,They paddle in the cold,Companionable streams or climb the air;Their hearts have not grown old;Passion or conquest, wander where they will,Attend upon them still. But now they drift on the still waterMysterious, beautiful;Among what rushes will they build,By what lake's edge or poolDelight men's eyes, when I awake some dayTo find they have flown away?